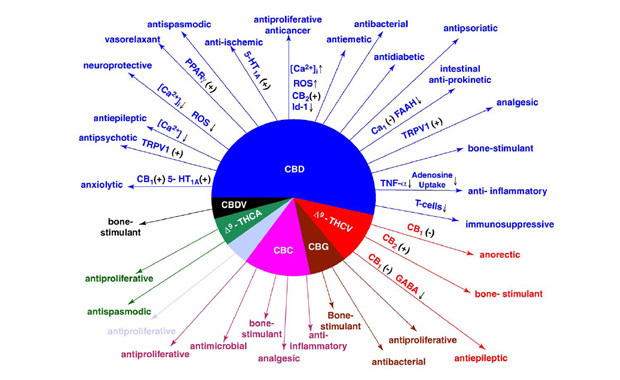 CBD and THC levels tend to vary between different strains and varieties of cannabis. By using selective breeding techniques, we have managed to create varieties with high levels of CBD and THC. Numerous studies suggest CBD acts to counter the intoxicating effects of THC, including memory impairment and paranoia. But cannabis with both CBD & THC is still psychoactive, just at a different level. Both CBD and THC have been found to present no risk of lethal overdose. However, to reduce potential side effects, medical users may be better off using cannabis strains with higher levels of CBD. “You could say it cured them”The results were presented at the Australian Neuroscience Society’s 2013 annual meeting and were published this week in Psychopharmacology. CBD (cannabidiol) can also stop metastasis in many types of aggressive cancers. Metastasis is the spread of disease from one organ or part to another non-adjacent organ or part. Research conducted with 102 patients in the Netherlands, who consumed three different varieties of cannabis for medicinal purposes pharmacies show that the pharmacological effects differ depending on the proportion of THC and CBD. These studies have been carried out by the Netherlands Institute of Mental Health and Addiction in Utrecht and the Office of Medicinal Cannabis of the Dutch Health Ministry and published in the Journal of Psychopharmacology. 47% of patients consumed the variety Bedrocan with 19% THC and less than 1% of CBD, the Bedrobinol range 28.5% to 12% THC and less than 1% of CBD, and 24 ‘ 5% Bediol with nearly equal amounts of THC (6%) and CBD (7.5%). Statistical analysis revealed the subjective effects of the high THC in varieties Bedrobinol Bedrocan and resulted in an increase in appetite compared with Bediol. There was also a higher level of anxiety and depression in the group that consumed compared Bedrocan took Bediol. The most common cannabis medical indication was a chronic pain (53%), followed by multiple sclerosis (23%), and 86% of patients experienced therapeutic satisfaction regardless of the variety of cannabis used. The study authors say that “these results show that patients relate satisfactorily with therapeutic pharmaceutical cannabis, mainly pain relief.” The amount of cannabis used did not differ between the different strains. With regard to the different effects, the authors suggest that “the CBD can have a modulating effect on some of the known subjective side effects of THC, such as anxiety and depressed mood”. The natural cannabinoid cannabidiol (CBD) is able to control the symptoms of the disorder of REM sleep behavior. This is the result of four cases investigated by the Department of Neuroscience and Behavior of the Faculty of Medicine of Ribeirao Preto, University of São Paulo, Brazil. The disorder of REM sleep behavior is characterized by loss of muscle weakness during REM sleep associated with nightmares and sleeping active behavior. The researchers describe the effects of CBD in these symptoms in patients with Parkinson’s disease. They saw that the four patients treated with CBD had a rapid and substantial reduction of the frequency of events related to the disorder of REM sleep behavior without presenting side effects. The phase of rapid eye movement (REM) stage of sleep is characterized by a rapid and random movement of the eyes. Souvenirs vivid dreams occur mostly during REM sleep. An experimental CBD extract of the British company GW Pharmaceuticals has produced promising results in a small study of children with epilepsy of difficult treatment. The latest findings of its new product Epidiolex are the result of the monitoring and evaluation of 27 children and young adults with refractory epilepsy to those who are given the drug in two hospitals in the United States. The Epidiolex is administered as a syrup flavored strawberry-lime twice daily. The drug does not contain THC. GW said on June 17 that after 12 weeks of treatment in an open label study results are “encouraging”, with a reduction in seizure frequency of more than 50 percent. Now plans to initiate a clinical trial phase II / III in the second half of the year. The CBD can help children with severe epilepsy syndromes such as Lennox-Gastaut and Dravet, where attacks often persist despite high doses of several anti-epileptic drugs.